Hi there friends, and thanks for joining me back for another edition of Stew’s Reviews! I know you’re all very concerned, so I’ll provide you with a quick update to start us off: they are still building those damn townhouses about 30 feet from my home. This is my life now. However! The early morning pounding this morning also featured one of the crew members singing “Hello” by Adele at the absolute top of his lungs. And that… was actually kind of glorious, I have to admit. 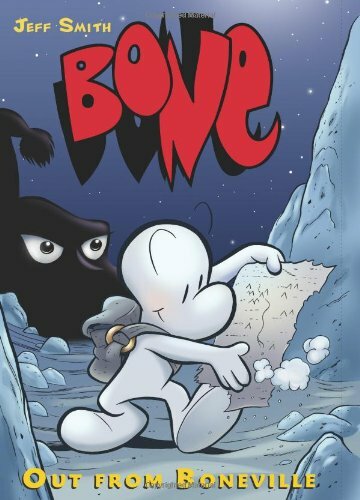 That said, I endeavor to provide you with the comic book reviews you crave, and therefore I used my breaks at work to get my reading in on a book I’ve actually never picked up before, Bone. It’s just one of those books that I’ve always heard so much about, but it just never found its way onto my personal radar. Well, I finished the first volume and what did I think? Let’s found out. Aaaand he just started singing “Total Eclipse of the Heart”. I have to admit, things are looking up. What? You’re not here for a play-by-play on the musical journey of a construction worker? That makes sense. Bone is handled exclusively (well, in regards to writing and art) by Jeff Smith. It’s the tale of the three Bone cousins—Fone, Phoney, and Smiley—after they are chased from Boneville because Phoney’s repeated get-rich-quick schemes have pushed his neighbors too far. After two weeks on the run, the cousins find themselves lost in a desert, and that’s where the story begins. The desert is uncharted territory to the Bones and is not found on the map they brought with them from Boneville, but Smiley soon finds another crudely drawn map abandoned in the wasteland. Unfortunately, before they can make much out of it, they are separated when a cloud of locusts descends on them. From there, the story follows Fone, who falls off a cliff in the locust storm, as he attempts to corral his missing kin. Wandering a foreign forest, Fone interacts with a new cast of characters, including a bug named Ted, a family of possums, a race of vicious rat creatures, a [somewhat] friendly red dragon, and most importantly, a human girl named Thorn. That last one actually blew my mind somewhat when I got to it because I had thought the Bones were supposed to be a cartoonish reflection of humans. But apparently not. So… what are they? 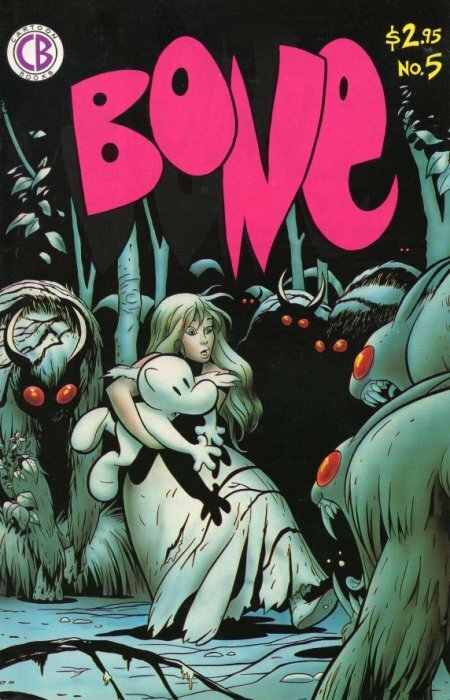 They’re all named Bone, they’re from Boneville… are they quasi-Smurfs? I guess the obvious answer is that they are just some kind of fictitious critter, but damn… that actually bothered me for a bit after Thorn showed up. They’re something. They’re Bones; I don’t know. Fone accompanies Thorn back to her house; part out of the hope that Thorn’s grandma can help him and part out of his being enamored of Thorn herself. Meanwhile, it isn’t long before Phoney meets Grandma on her way home, insults her, and is chased back home where Phoney and Fone are reunited. Grandma, who it turns out is a renowned cow racer, allows Thorn to keep the Bone cousins as long as they live in the barn and assist with farm work. There they stay for some time before Phoney finds out about the cow races and comes up with a new scheme to set himself up as the bookie. New plan in mind, he leaves in the middle of the night. He finds Smiley Bone working as a bartender, but while they reunite, the rat creatures—at the behest of the eerie, hooded figure that leads them—stage an attack of Thorn’s home. It’s during and after the surviving the rat creature attack that it becomes apparent that there is more to Grandma than meets the eye. She claims to have fought in “the big war” against the rat creatures and is quite adept at handling them; also, she is one a first name basis with the red dragon that, up to that point, no one but Fone had seen or believed exists. Oh, and she gets spontaneous dizzy spells, apparently? There’s a lot going on there under the scratched surface. Out From Boneville actually sets up a lot of little tidbits like that to draw you in and keep you interested. Aside from Grandma’s mysteries, there’s something to Thorn’s past, also. She has a vague recognition of the crude map the Bones found in the desert but can’t put her finger on why, and she has nightmares about a rat creature attack and a fire from her childhood. In addition to all this, there’s also the eerie, hooded figure who has the rat creatures looking for Phoney specifically, with the implication being that Phoney may have sold his soul to the figure. If nothing else, it makes me want to keep reading just to find out all the answers. Oh god, this is the children’s version of Lost, isn’t it? +It’s just a flat out decent story. It’s aimed at children but it’s accessible to adults, and the mysteries of the story can maintain either’s interest. There is humor and action and even a little bit of romance, with Fone’s infatuation with Thorn. It’s a got a bit of everything for everyone. +Jeff Smith handles the story and art, so everything is quite cohesive. The art is quality, too. The Bones might be very basic in their appearance, but Thorn, Grandma, and the rat creatures all show that Smith is a quite talented artist. +Maybe this is just my looking too hard at things, but a lot of the main characters seem to represent versions of the Seven Deadly Sins very effectively. Fone’s almost debilitating adoration of Thorn is a child-friendly version of Lust. Smiley is lackadaisical and easy-going, akin to Sloth. Grandma is a great representation of Wrath when she fights the rat creatures or assaults Phoney for insulting her cow. Ted the bug has a great deal of Pride and doesn’t like to be called small. And Phoney… jeez. Take your pick. Avarice, pride, wrath… he’s a bunch. I assume the story going forward is about these characters dealing with their short-comings, but like I said… maybe I’m just seeing things that aren’t there. -It’s a GOOD story that just isn’t a GREAT story. It’s funny, but not laugh-out-loud funny. There are intriguing mysteries, but they aren’t so compelling that I have had to get into volume two right away. The characters are fun, but a bit one-dimensional and basic. It just does a lot of things very well, but nothing on its own really stands out as utterly fantastic. This sounds harsh the more I re-read it, but as far as flaws go, “Well, I guess it’s not AMAZING” is a pretty good one. Bone is a good read that it took me way too long to get into. I’ll eventually power my way through the rest of the volumes to see where everything goes, and that’s better than not feeling moved to keep reading at all. It’s absolutely worth investing in!